The Wolverhampton, Walsall and Midland Junction Railway Act received the Royal Assent on August 8th 1872, authorising the WW&MJR Company to build the line of railway which now crosses over Rectory Road and Coleshill Road on its way to join the main line at Castle Bromwich and Water Orton. The railway was completed in 1879 by the Midland Railway Company, which had superseded the WWMJR with a new Act in 1877, almost identical with the 1872 Act. 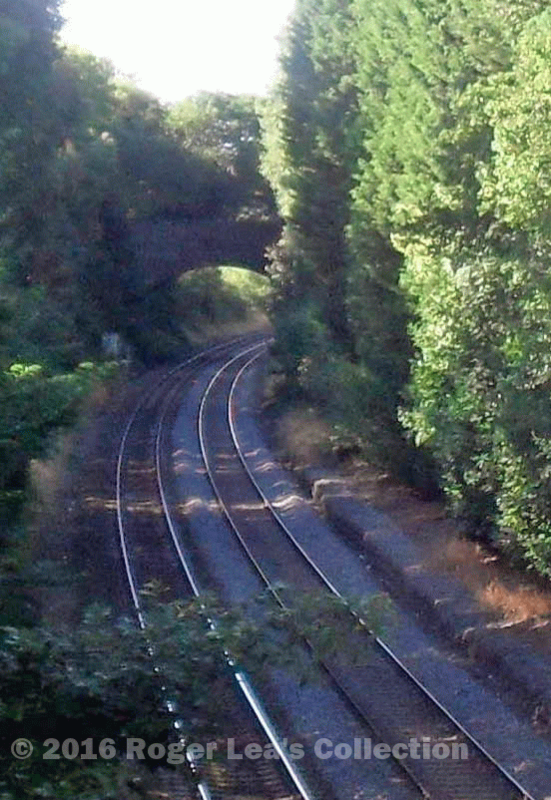 The railway splits into two to make its junction with the Midland Railway’s main line in the Tame Valley, one half curving east to Water Orton, the other west to Castle Bromwich. At this point the main line is about 280 feet above sea level, while the summit of the WW&MJR at Streetly is about 500 feet; when surveying the route the company’s surveyor needed to choose a line with only moderate inclines. The railway crosses Kingsbury Road and the Birmingham and Fazeley Canal at about 310 feet and the steady climb continues to Penns Lane, 370 feet above sea level. There is a slight downhill stretch as the line crosses the E Brook and follows East view road, and then the next steep section takes it over Coleshill Road and Rectory Road to the old Sutton Town station in Midland Drive at about 420 feet. Having determined the route, the concerns of the landowners had to be resolved. There are special clauses in the 1872 Railway Act regarding the impact of the line on the property through which it passes, for example the arch of the bridge over the canal must be at least ten feet above the water surface. Ashurst Road was then little more than a track, but the Company had to provide a bridge as they did for all roads and footpaths crossed by the line. In 1872 the Ashurst Road bridge was on the Sutton boundary, and beyond it lay bridges under Eachelhurst Road and Penns Lane, and the Penns estate of James Horsfall. 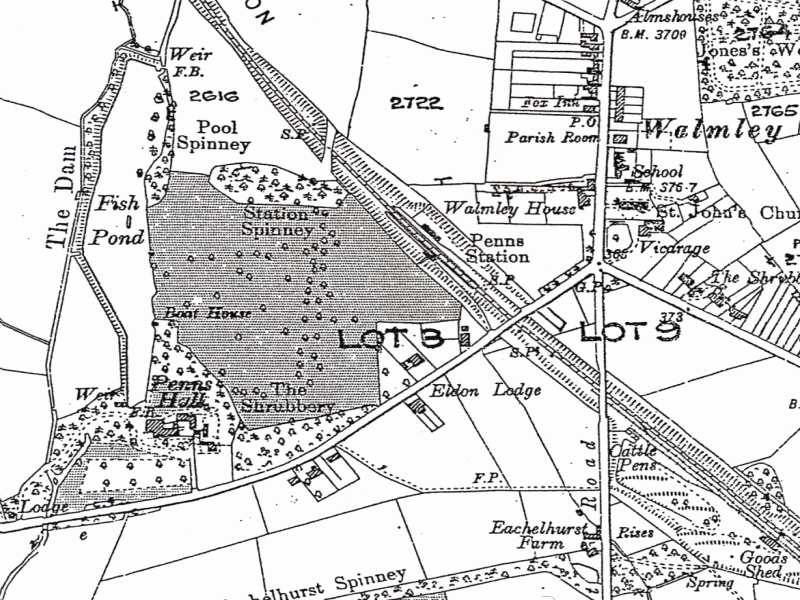 A more likely explanation is that Horsfall had an eye to residential development, because the clause continues “The Company shall also construct a station on the said lands at the corner of Penns Lane similar to the present Gravelly Hill Station on the Birmingham and Sutton Coldfield Railway.” There had been a housing boom at Gravelly Hill when the station opened there, and Horsfall’s requirement for a station at Penns, at the time a rural area not normally meriting a station, suggests that he was hoping for something similar. The Midland Railway’s revised Act required only one of Horsfall’s three bridges to be built, but the anticipated housing development did not take place, and no road has ever crossed the bridge, only a footpath leading from Penns Lake Road to the New Hall Valley Country Park. The Walsall and Water Orton Railway passes beneath the bridge built for James Horsfall of Penns Hall but never used. Part of the plan accompanying the 1948 sale of the Penns Estate. The shaded area is the park belonging to Penns Hall, and shows an avenue of trees leading towards the redundant railway bridge (plan copy supplied by Sutton Reference Library).